TM JI introduced the company activities which were related with development of leadership. She engaged in several activities like IGEN,PCN,LGPT+ and DAN. Tech4Girls(Tech for Girls). Because the percentage of women engineers are so low. She that she was trying to involve her company colleagues for educating technical issues to other ladies. She also believes such educating activities will be beneficial to her leadership development. The speech fully drew attention of the audience and showed speaker’s confidence by her voice control and eye contact. The topic was well matched to the present circumstance. The episode might have reduced to only so that the speaker could deepen the case. TM MY took up the actual case of his son who started the computer programing at his elementary school from the scratch. He showed the research result that 46% of the parents considered such training of computer programing might be beneficial to their children for their future carrier opportunity. TM MY also picked up the other analysis and statistics. Such implied that the bright future carrier opportunity might be opened to the younger kids of developing countries rather than Japan. He emphasized that keeping interest, creativity and logical thinking might be the key factors for kids’ future. The speech went very smoothly due to the logical following the research figurers. The question and answer style procedure made the audience easy to understand the contents. It was amazing and good point that the speaker led the audience to the unexpected conclusion against the everybody’s expectation. It seemed be better that the showed slides might have been bigger, so that the audience could recognize the figurers clearly. TM KK started to talk about the world population(7.4billion). The actual population is much bigger than the one we learned in our school days. He pointed out the uncomfortable fact that we Japanese made enormous food waste these days. Even though we have an idea of “MOTTAINAI” and the advanced logistic system in Japan. For example, a lot of “EHOMAKI” was thrown to the garbage after a certain day. TM KK expressed that he would fight against such miserable food waste situation by doing some actions like choosing minimum expiry date products. The speaker’s voice control was natural and smooth. The face looked serious and wats well matching to the contents. Many questions to the audience were effective to catch audience interest. The example of “EHOMAKI” was just fit to the main theme. 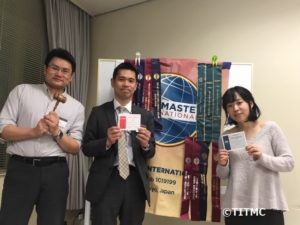 We had the induction ceremony for Mr.Noguchi and Ms.Hirakawa who were welcomed as new members of TITMC. 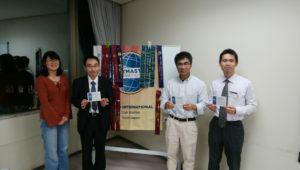 This night we held the club contest both in English and Japanese for the annual conference. Therefore, the meeting started earlier than usual and all the judges, helpers and contestants attended the briefing. 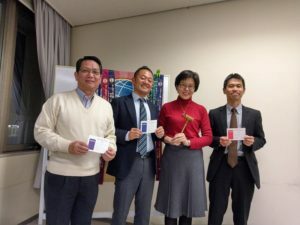 The contest was managed by the contest chairs and the chief judges on time very smoothly. TM N.K., TM H.Y., TM A.O. presented the speeches in English. Because of the contest rules, the details of the speeches cannot be printed in the report, however, every speech was unique and well-prepared. The audience, including guests, enjoyed the night. 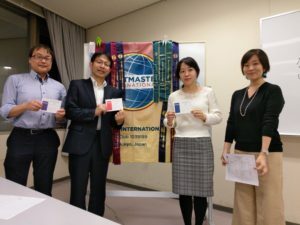 In the Japanese contest, TM A.O., TM H.Y., TMA.K., TM M.K. delivered the speeches. Every one of them were high-level with a good sense of humor, which entertained the audience. During the judgement and ballot counting time, TM A.T. and TM K.H. interviewed with the contestants. Again, this session contained the details of the speeches and cannot be printed. The only thing I could write down is two of them asked what I wanted to ask. So the most exciting moment has come!Award ceremony! The rankings are as follows. English: 3rd| TM N.K. 2nd| TM H.Y. 3rd| TM A.O. Japanese: 3rd| TM N.K. 2nd| A.O. 3rd| TM K.A. One of the guests, TM K.R. 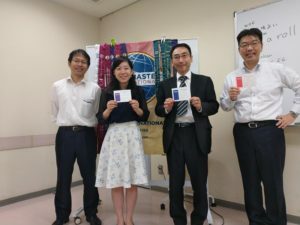 said she was impressed a lot by the speakers and looked forward to the Area contest. The President began his opening remarks by reminding the attendants that this meeting was the last one in 2018. Today’s TMOE was TM J.S., and today’s word is “pun” from TM K.A. The title is “Whatever, Whenever, Wherever”. learn English and also mentioned the problems like high cost. Then, he introduce the latest service “Italki.com”, where we can find personal tutor. By using Italki.com, we can learn English Whatever, Whenever, Wherever. She wants to be a little puppy. Evaluation was made by TM T.M. He drew the matrix of the evaluation points and did perfect evaluation. 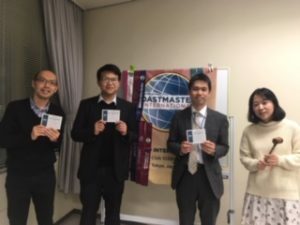 We smoothly started our TM club meeting for the meeting# 280 on time as usual. 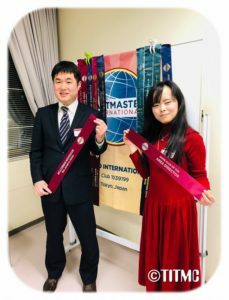 Because today TMOE is TM E.H, she is one of our club master, so everything was just started very smooth and made us very comfortable atmosphere. 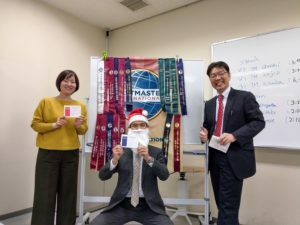 This time we had two guests, and one of them used to attend INDIA and Hong Kong TM clubs. 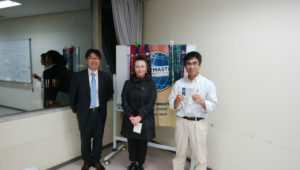 Wow, he has already been experienced for Global TM clubs and holds excellent English skills. Tonight’s Word of the Evening was “iffy”. Our Club President of TM K.S draw the face of “Miffy” on the whiteboard, but the tonight words “iffy” which doesn’t have any connection with “Miffy” (Hahaha… ) The other meaning is uncertainty. For first one hour, it was an English session. First speaker was TM S.H. This is the first time for him to speak out for our TM club. The title is “My Self”. This speech was project#1 “The Ice break”, so that he explained the culture of Sri Lanka and how different between Japan and his hometown. Even though, his first speech, he always gave his smile and showed his confidence on his speech. Second Speaker was TM C.Y. 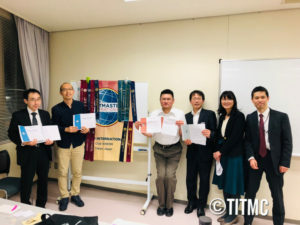 The title was “A Procedure for Toastmasters Club Establishment” Didn’t he bring such a great PPT material from TMC organization? The all slides of PPT were very awesome. His speech was very excellent and it was very easy to understand for audiences to hear what he would like to explain. He is one of veteran of out TM club, so the contents of the slide and the speech were exquisite timing. Third Speaker was TM H.S. The title was “Memory Palace”. The aim of project is #8 “Get comfortable with visual aids”, so that he usually prepared PPT materials with Artistic sense and always invited us to imagination and the surprise world. 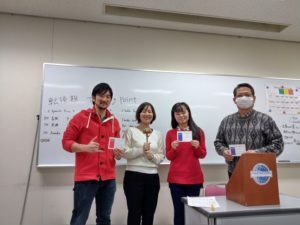 As to how to memorize, it was unique to get hints from objects of regular commuting courses. It was very smart and unique speech.